Sumer was located in Mesopotamia, now its in the Middle East, or Iraq. It is located in between the Tigris and Euphrates river valleys. The exact coordinates are not possible, because Sumer is a lot of different city-states in the Fertile Crescent. 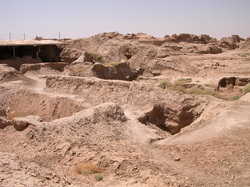 This is remains of a old Sumerian village. They are from the time period B.C. so they are mostly destroyed.